Product Description Determines the corrosion preventive properties of greases when distributed in a tapered roller bearing stored under wet conditions. Distributes a lubricating grease sample in a roller bearing by running the bearing under light thrust load. Corrosion preventive capability is determined on a pass/fail basis by the presence of rust spots (1mm or larger) on the bearing race after a 60 second run-in period followed by prolonged exposure to water at constant temperature. 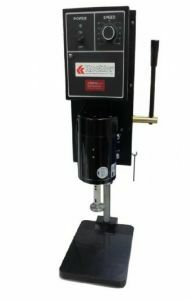 Consists of variable speed motor, 1750rpm run-in stand, bearing holder assemblies, spindle/thrust loading device, mechanical grease packer pliers and test bearings.